Swarovski hand set sapphire crystals & alternating nickel stars add that extra touch to this black leather 1.5" wide collar that tapers to 1" for a comfy fit on your dog's neck. The 1/2" royal blue leather stripe down the center shares the colors to those that offer support and protection in our lives. Your dog will love the feel from the vegetable tanned leather lining. It wears well over time with everyday use against your dog's neck. The painted edges and painted holes for the sizing are a part of what makes these collars special. All collars and leads are lead-free and hand-crafted in the USA. 12" , 14" , 16" , 18", 20" , 22"
Size(s) 12", have a 1/2" distance between each hole. Size(s) 14", 16", 18" and 20", have a 3/4" distance between each hole. Please measure the actual size of your dog's neck. The size is your dog's actual neck measurement. There are 5 holes and the size fitting the center hole closed is the size stated. If the actual measurement is between two sizes, order the larger size. To measure your dog's neck, take a piece of string and wrap it around their neck where a collar should go. Mark the string, then lay it flat and measure it. That is the circumference of your dog's neck. Of course, tape measures work too! Our collars are sized when closed to the center hole. We estimate delivery as approximately 3-5 weeks but will try our best to get it to you sooner. 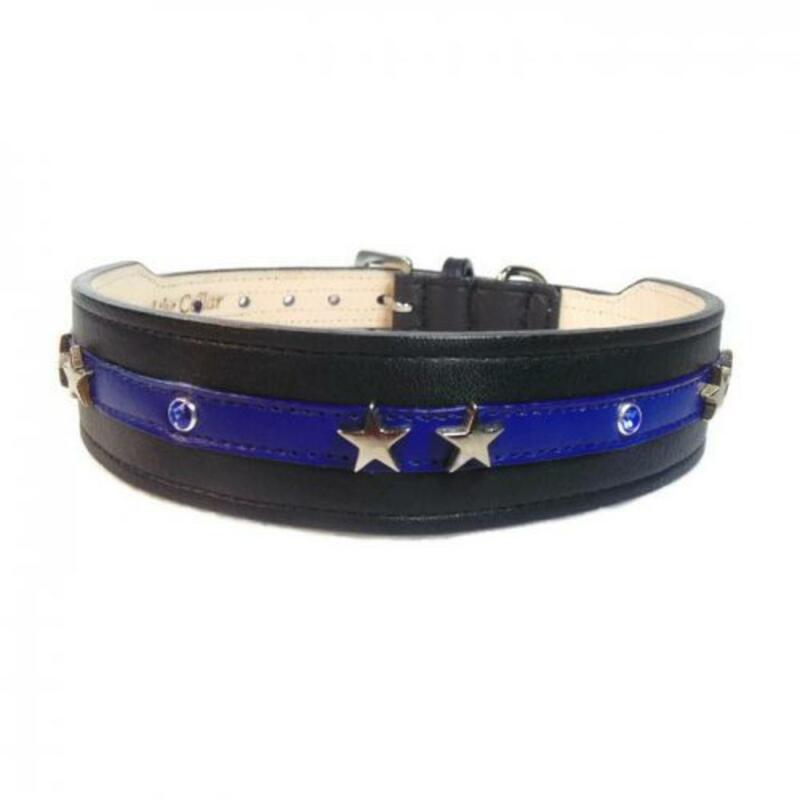 Quality and attention go into every detail of this handcrafted designer leather dog collar ensuring it will truly be worth the wait. This is a custom made to order dog collar and not eligible for exchange or return.